Over 1 million Americans have served in Iraq and Afghanistan in the past four years, but fewer than 500 from this group have earned a Silver Star, Navy Cross, Air Force Cross, Distinguished Service Cross, or the Medal of Honor. Those who have been awarded these distinguished honors all demonstrated an extraordinary courage under fire in the worst of circumstances. These Americans come from all branches of the military. They also come from all over the country and all walks of life, representing the entire spectrum of races and creeds. But what unites them are their deeds of consummate bravery, beyond the call of duty. 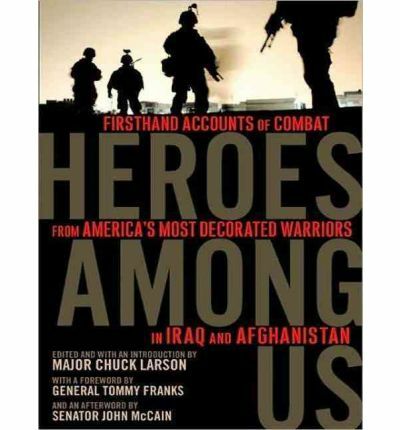 Heroes Among Us tells their extraordinary true stories of valor, honor, and sacrifice. A U.S. Army major who served in Iraq during Operation Iraqi Freedom presents twenty-nine true stories of courage from the frontlines of the current wars in Iraq and Afghanistan. About the Author: Major Chuck Larson served for a year with the U.S. Army in Iraq during Operation Iraqi Freedom and was awarded the Bronze Star. A former chairman of the Republican Party of Iowa, Chuck is currently Iowa's state senator. Lloyd James has been narrating since 1996, has recorded over five hundred books in almost every genre, has earned six AudioFile Earphones Awards, and is a two-time nominee for the prestigious Audie Award. His bestselling and most critically acclaimed performances include Elvis in the Morning by William F. Buckley, Jr., Ben Hur by Lew Wallace, Searching for Bobby Fischer by Fred Waitskin, and Mystic Warrior by Tracy and Laura Hickman. Lloyd's background as a performer includes extensive work in classical theater and folk music. He lives in Maryland with his wife and children.